I really like saying gougère. So much that I refuse to look up how to properly pronounce the word. What if I'm wrong? 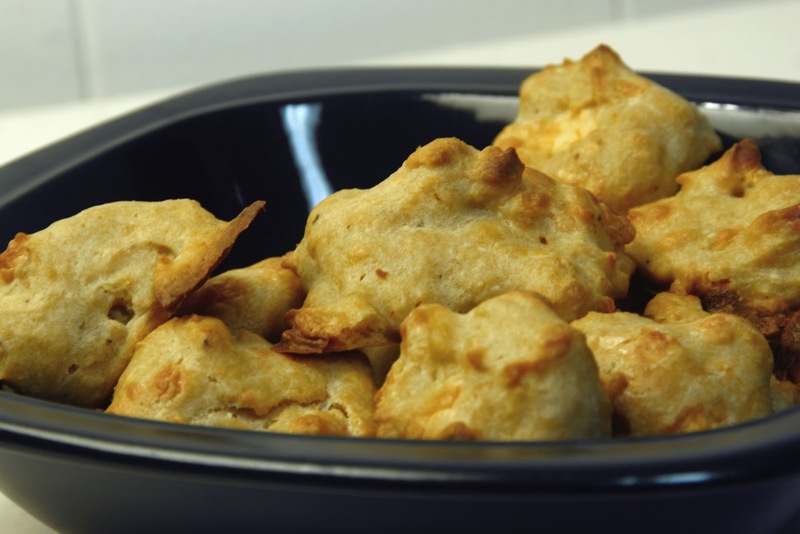 I don't know that I could go through life without saying gougère with a exuberant flare that makes francophiles freeze with fear and disgust. 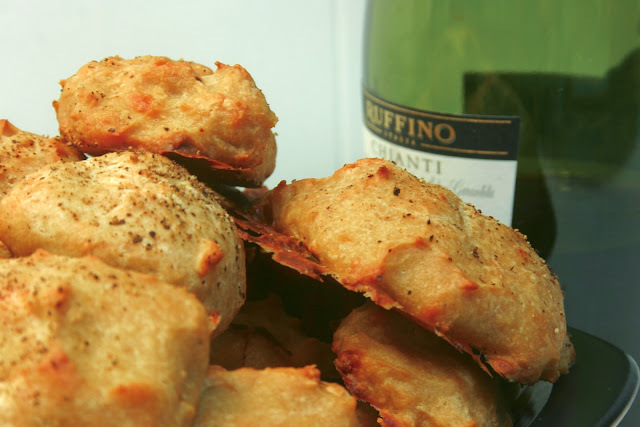 There are alternatives, sure – cheese pastries, cheese poofs – but none of them are as much fun to utter, or carry the same air of awkward pretension, as gougère. Seeing as I'm not the best of bakers (holler in the comments if you feel my pain), I wasn't able to maintain the perfectly round shape that these cheesy mounds of deliciousness generally take. Now, I could lie and say, “I was just trying to stick to the recipe's 18th Century origins by making these flat and round instead of spherical,” but then I'd have to stay perfectly true to the original version of this process, and prepare a mixture of herbs and animal's blood in a sheep's stomach before tossing it all into the gougère mixture, and I think that may turn off a few people. Namely, me. Aside from the molding and shaping involved (you'll probably have more luck with that than I did), this is a very easy recipe that's remarkably easy to customize to your tastes. 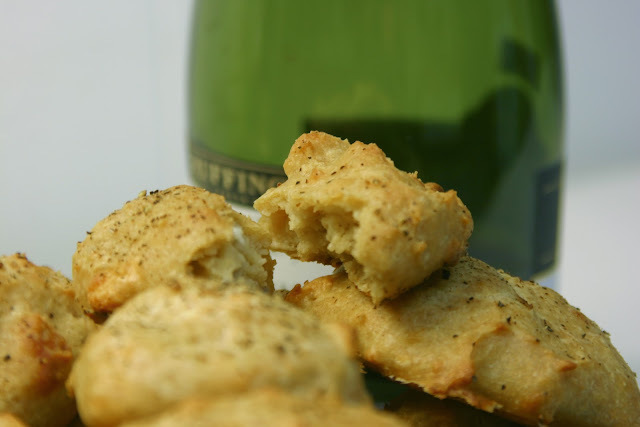 These blue cheese and pepper gougère have a more subtle taste that work great as an appetizer or reception snack. Heat the mixture for several minutes on medium-low – don't stop stirring! 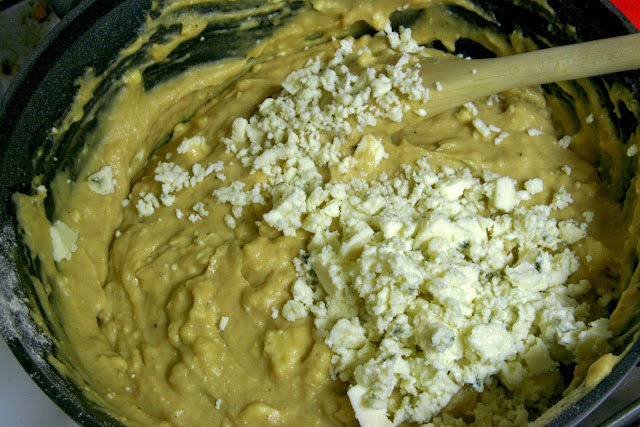 Remove from heat again, and add the eggs, mixing them in one at a time – the dough should develop a bit of a sheen. 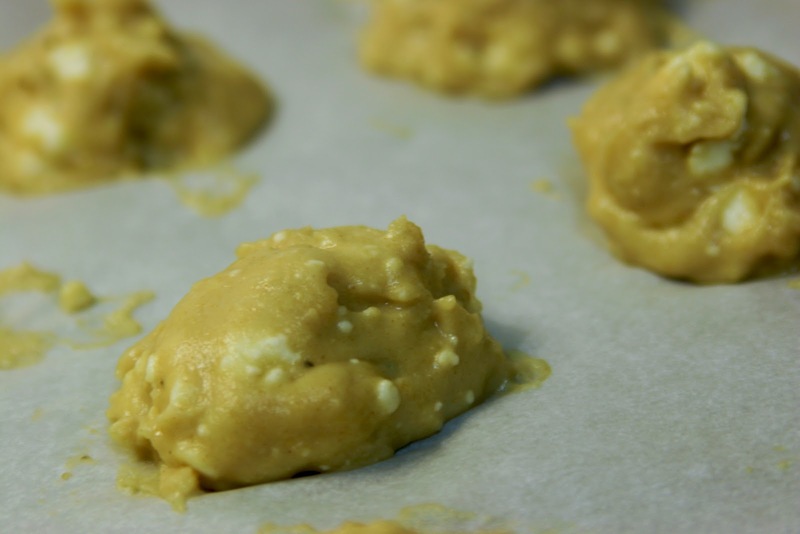 Line a baking sheet with parchment paper, and using two spoons, dollop small mounds about 2” wide spaced about 1” apart. I would suggest serving these warm. If you can't serve them right away, put them in tupperware and leave them in the fridge, then reheat them in the oven when ready to serve. These can go stale really easy, so never make them more than a day in advance. Let me know if you have better luck than me getting them to come out perfectly spherical. In the meantime, I'll forget about the shape and just revel in the taste. That's right...who cares about the shape...taste is what matters! Great post!